Product #3175 | SKU ADI6432 | 0.0 (no ratings yet) Thanks for your rating! 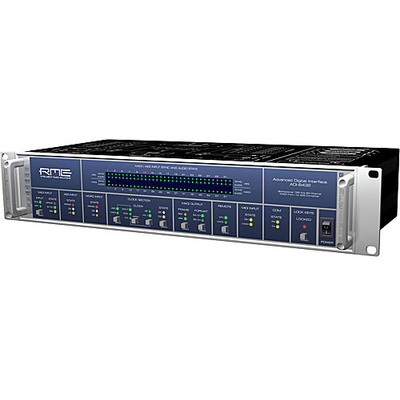 The ADI-6432 from RME is sixty-four-channel format converter, that features conversion from MADI to AES, and vice versa. Typical applications could include two units for use as a digital multi-core, or a single unit used as AES/EBU front end for the Hammerfall DSP MADI PCI card. MADI handles sixty-four channels of 24-bit audio at sampling frequencies up to 48 kHz, thirty-two channels up to 96 kHz and sixteen channels at 192 kHz. All channels are transferred across a single cable, using either a coaxial (BNC) or optical network cable. The AES/EBU channels are available via eight, 25-pin D-sub connectors. The unit features RME's SteadyClock, which provides very low jitter operation. Intelligent Clock Control retains the last valid sample frequency in case of a loss of the input signal. The front panel contains almost one-hundred LEDs for accurate and exact display of signal status. Errors can be spotted instantly and corrected, and the control keys can be locked to prevent accidental changing of settings. Multiple units can be stacked and operated sample-aligned, using word clock.